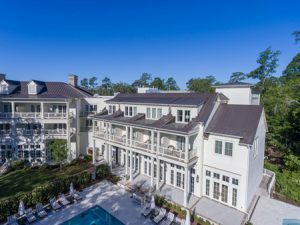 Palmetto Bluff Resort in Bluffton, South Carolina, now has a 74-room inn with a metal roof finished in custom Patrician Bronze color. The recently expanded Palmetto Bluff Resort in Bluffton, South Carolina, now has a 74-room inn with a metal roof finished in custom Patrician Bronze color. Approximately 6968 m2 (75,000 sf) of 24-gauge galvalume panels were installed on the resort. Designed by Dallas-based HKS Architects, the new inn was inspired by the R.T. Wilson Jr. mansion built on the property in the early 1900s. The resort is set within the 8094-ha (20,000-acre) Palmetto Bluff community and conservation preserve. The inn is finished with artisan siding on the exterior façade. Standing-seam metal roof was chosen to complement the building’s classic Low Country architecture. Installation of the panels on the 14,307-m2 (154,000-sf) luxury inn was done by Southern Roof & Wood Care (SRWC) in Hardeeville, South Carolina. “It was a complicated job with three adjoining sections of the roof and lots of different elevations and planes and dormers. The flashing details were complex,” said David Swanson, president of SRWC.